Tired of chasing customer proposals? Tired of trying to understand “social media marketing”? Tired of hassling with Building Inspectors? We do all that so you can concentrate on carpentry. Our residential construction company is growing, and we have openings for an experienced, senior carpentry crew. 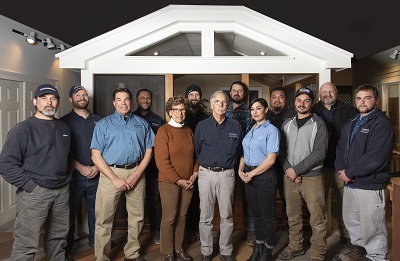 You will build decks, porches, and sunrooms from detailed structural drawings, specifications, and 3D renderings — under the guidance of our Construction Manager. Demolition is completed and footings are installed before you arrive on site, so you can concentrate on carpentry. We interact with the homeowners and with the Building Inspectors, so you can concentrate on carpentry. Every job has a portable toilet and lumber already delivered on-site, so you can be productive. You should have at least 8 years’ experience in framing, interior and exterior trim, roofing, and siding. You must be able to read and follow detailed drawings, work independently from start to finish, and follow the daily guidance of our Construction Manager. You must have a good work ethic, be reliable and drug-free, and must present a clean, professional appearance. You need your own tools, truck, and insurance. Our projects are west and north of Boston. We pay you by the job as a subcontractor, so you know what you’ll earn before you begin. If you work productively, you’ll earn more than an average day’s pay. Please send us your resume, including email address or phone number, and tell us where you live. Qualified candidates should identify their town of residence and e-mail resumes to [email protected] Thank you.